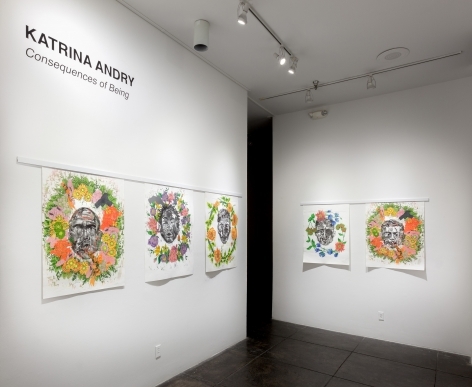 JONATHAN FERRARA GALLERY is pleased to present Consequences of Being, an exhibition of artist Katrina Andry. 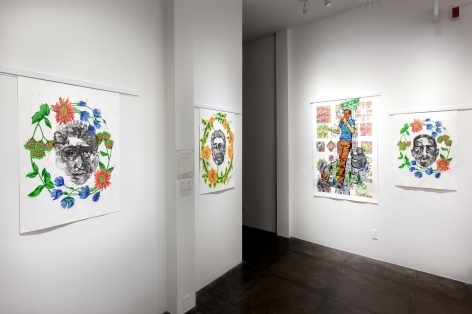 For her second solo exhibition at the gallery, Andry unveils new reduction woodcut prints addressing exoticism, stereotypes and the burden of violence against people of color. 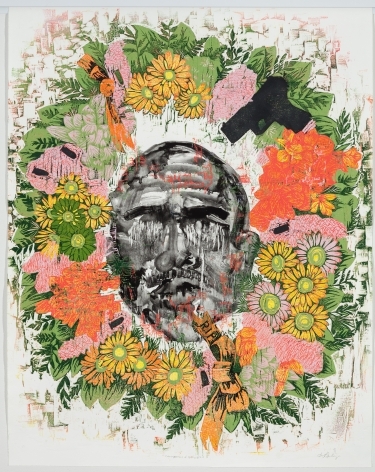 The exhibition will be on view in the main gallery 29 March – 27 May with First Saturday Gallery Openings on 1 April and 6 May (in conjunction with Arts District New Orleans’ fundraiser Jammin’ on Julia) from 6-9pm. Andry says of the new work . . .
My new work for the exhibition addresses gun violence, which kills black men, specifically in our community of New Orleans. 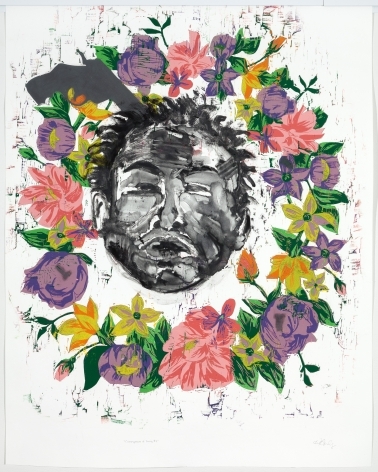 The portraits are displayed in funeral wreaths, some depicting symbolism of assault with a deadly weapon. The work is not only meant to be a "Black Lives Matter" statement, but also, to create somberness and ominousness around the issue of brutality perpetuated against people of color in our community. 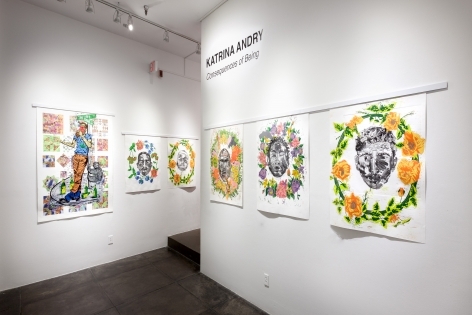 A native of New Orleans, LA, Katrina Andry received an MFA in Printmaking from Louisiana State University, Baton Rouge, LA in 2010. She currently works and lives in New Orleans. 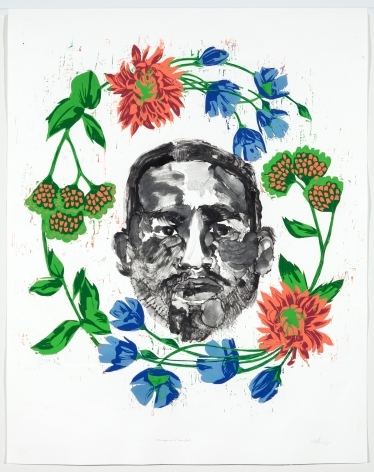 Andry’s work explores the negative effect stereotypes have on people of color. Where stereotypes are typically used to help us normalize our surroundings by categorizing groups of people, the byproduct of stereotypes is that they also create arbitrary differences between people. Stereotyping establishes an arbitrary set of societal norms/rules that benefit the majority while it disenfranchises other groups of people. 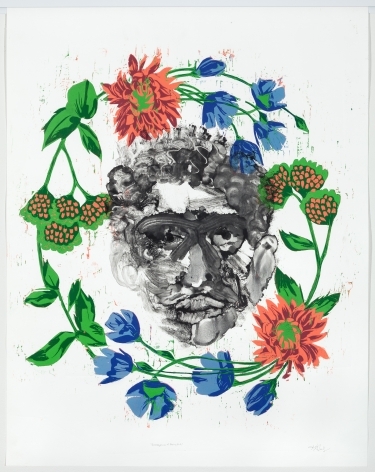 Andry’s work challenges stereotypes placed upon people of color (the Other), which once had scientific research qualifying them, and how these ideas or stereotypes have become a part of how we see each other, whether consciously or unconsciously. 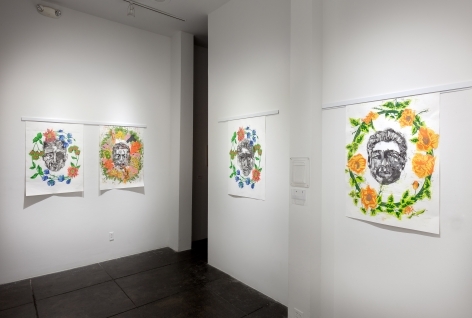 In her practice, Andry often creates large scale (4’ or greater), color reduction wood cuts portraying white men in black face, or more recently, watermelon face acting out a stereotype that is most often placed upon people of color. Andry specifically uses white men as they are typically seen as figures of authority, and are historically the perpetuators of stereotypes against people of color (though people of color often enforce these same stereotypes in their own communities, but it’s not as pervasive, as people of color are more self-aware of these actions most often). 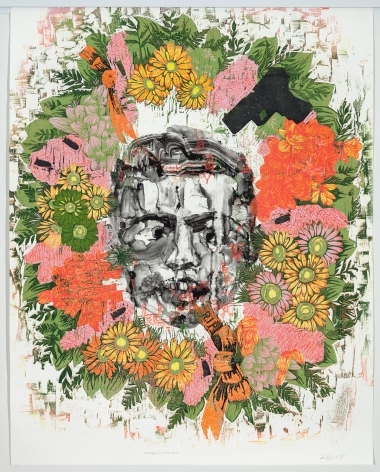 Andry also uses non-people-of-color in her work so the prints aren’t misperceived as being an expression of black culture. The fact that they are sometimes seen as that, speaks to the truth of how well engrained stereotypes against people of color are in our culture. 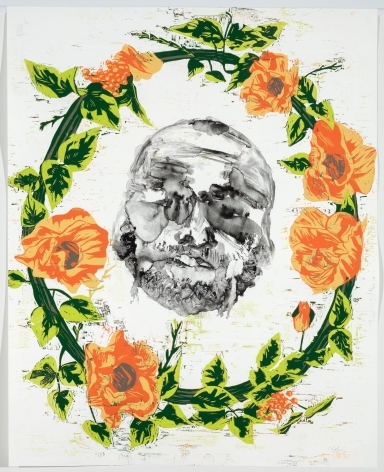 Katrina Andry was listed in the January-February 2012 issue of Art in Print as one of the top 50 printmakers. 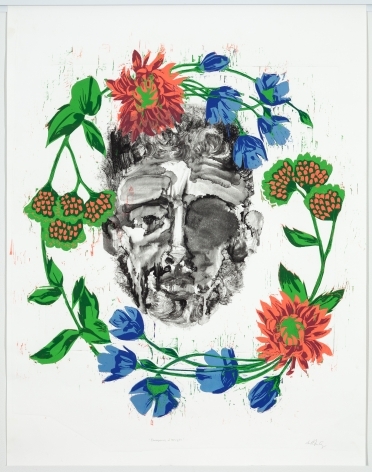 In 2015, her work was featured in the Editor’s Selection of the June/July South edition of New American Paintings 118. 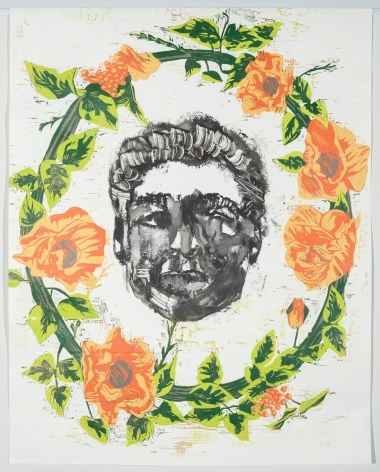 She is currently being represented by Jonathan Ferrara Gallery in New Orleans, and is also an active member of the Staple Goods Collective in the St. Roch neighborhood of New Orleans. 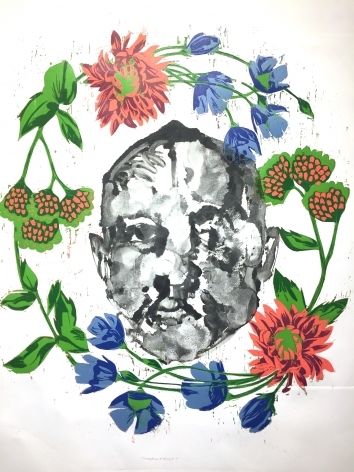 She has also been awarded residencies from the Joan Mitchell Center of New Orleans, Anchor Graphics in Chicago, and Kala Art Institute in Berkeley, CA. Her work is in numerous collections including C.C.H. Pounder, Stella Jones Gallery Collection, The Saratoga Collection, Drive By Press Permanent Collection, Dirty Printmakers of America State to State Relief Portfolio, Ladies of the Letterpress Old Maid Card Exchange, and Bridges Portfolio Exchange. 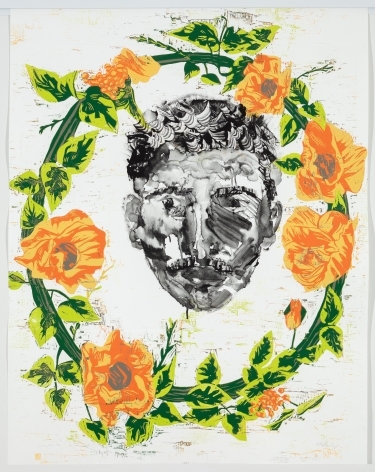 Please join the conversation with JFG on Facebook (@Jonathan Ferrara Gallery), Twitter (@JFerraraGallery), and Instagram (@JonathanFerraraGallery) via the hashtags #KatrinaAndry, #ConsequencesOfBeing and #JonathanFerraraGallery.